Redevelopment of Toronto’s eastern waterfront, notably the “Port Lands” area southeast of Lake Shore and Parliament, was the first of many issues on which the Ford brothers’ vision for our future ran headlong into voters and Councillors. A fantasy of malls, Ferris wheels and a monorail did not fit with previous schemes for a naturalized river mouth at the Don and a well-designed residential/commercial neighbourhood. That battle ended with Council voting to send the whole design question off for review, a process now nearing its completion. Waterfront Toronto has a separate website for the public consultation process behind this review. From a transit perspective, plans for the eastern waterfront are a mess. Development of Queen’s Quay east is well underway and the area’s population is just starting to grow. The Corus Quay building east of Jarvis is now occupied. It begins a strip of develoment reaching east to the Don. Next to the east lies Sherbourne Common park. East of the Common stretching to Parliament is the Bayside development now in design. A very large block of land from Yonge to Jarvis is now in the preliminary stages of planning. The parking lot north of the Toronto Star building (east side of Yonge) will be redeveloped, and the large block of land owned by the LCBO will become available when they move their warehouse out of this prime downtown property. The Loblaws site at Jarvis makes a logical completion of the block. Given the densities approved west of Yonge, this superblock is likely to see very tall buildings at least on its western side. The Monde condominium project lies east of Sherbourne Common. Additional developments are likely in the future replacing older low-rise buildings. This just gets us to Parliament Street where a first leg of a proposed Waterfront east LRT line would have its temporary terminal. The line is beset by problems notably a lack of funding and a complete absence of any sense of urgency to provide “transit first” to a rapidly developing area. “Transit” will be little more than a bus, although with luck it will have its own right-of-way, one that should be built for easy conversion to LRT in the future. The estimated cost of this LRT is $250-million, small change beside the billions in rapid transit projects elsewhere, but the line is snarled in the politics of waterfront funding — a tangle of federal, provincial, city and private sector income. Work should be underway to expand Union Station Loop as part of the overall station expansion program, but instead this will be done as a separate future project thanks to a lack of co-ordination and no sense of the work’s importance. The situation long precedes the Ford era at City Hall, although the current anti-transit climate offers little improvement. Construction in the West Don Lands (Parliament to the Don, south of King to the rail corridor) is well underway with many private and public sector projects. A large segment of this is the Athletes’ Village for the 2015 Pan Am Games. These buildings will convert to residential use after the games. On Cherry Street, we will eventually see a spur line off of the King streetcar running in its own transit lanes on the east side of the street. However, this will not begin operation until after the games. Physical construction is already underway, and the transit way should start taking shape later in 2012, at least south from Eastern Avenue to the temporary terminal loop north of the rail corridor. When the segment from Eastern north connecting into King Street will be built is unclear. Connecting the Cherry and East Bayfront lines together looks simple on a map (they are only short blocks apart), but this is tangled in the future of the mouth of the Don River and funding for the Port Lands redevelopment. The original plan for the Lower Don Lands include a realignment of the streets at Cherry, Queen’s Quay and Lake Shore, but as this is to be funded out of the Port Lands scheme, when the two LRT lines might hook up is anyone’s guess. Despite the barrier formed by the rail and road corridors, this is one big neighbourhood, not two, and good transit service to the rest of the city is essential. A good analogy would be to remember how remote the western waterfront community felt until the Spadina and Harbourfront services began operating. The Port Lands cover a huge site (400 hectares, 988 acres) that is not even part of most Torontonians’ mental maps of their city. Stretching south from Lake Shore Boulevard from the eastern harbour to Ashbridges Bay (Leslie Street), it covers the equivalent of a block bounded by Yonge, Queen, Bathurst and Bloor. Much of the Ford vs Council debate last fall (and the rejigging of Waterfront Toronto’s plans this spring) turned on the premise that the Port Lands should be developed quickly to maximize revenue to the City of Toronto which owns, one way or another, much of the land. This tactic follows the Ford style of selling off whatever assets may be available for short-term gain rather than investing in the site for long-term benefit to the City. A revised design for the mouth of the Don replaces a large chunk of parkland with development parcels. The tradeoff is to reduce the cost of realigning the river through a simplified design while also freeing up more prime land for sale. Community reaction to this has not been positive, but the real question for Council will be how to finance the larger scale of parkland in the original plan. From a transit point of view, the important issues are the location and rate of build-out of development. At least three types of neighbourhood — residential, commercial and entertainment — are likely, but these each will generate different types of transit demand. If the Port Lands are developed piecemeal and transit is not in place before people move in, the transit habit will be harder to develop after the fact. This is not a place for the typical TTC approach of providing barely enough service as and when a would-be rider shows up. The contrast between the waterfront and hopes for and development of the Sheppard subway corridor could not be more striking. On Sheppard, many are prepared to invest billions on a “build it and they will come” premise, while on the waterfront, Toronto cannot find a few hundred millions to serve a real and massive new development already underway. The analysis begins with various maps showing the relative size of major development areas in Toronto and other cities. It is important to understand that this is not a small site on an international scale. This affects both the timeframe for development and the complexity of transportation requirements. Broadly speaking, the proposed land use places the residential component on the west side of the Port Lands taking advantage of the inner harbour and using a realigned Cherry Street as the main north-south road and transit spine. To the northeast, the land use would be primarily commercial and would reinforce the Film Studio district already in place. The lands to the south would be primarily parkland and recreational uses. From a transit point of view, concentrating residential development around Cherry Street will support the proposed LRT line, provided that the TTC actually builds and operates it in anticipation of the development rather than as an afterthought. However, this brings transit only to the northwest portion of the site, and begs the question of how service will be provided to commercial and recreational lands far from the Cherry Street LRT. The TTC may be coaxed into building trackage east along Commissioners from Cherry to serve the commercial developments and, as a convenient add on, provide an alternate route to Ashbridge Carhouse at Leslie Street. However, a line running down to, say, the existing Hearn Generating Station site is quite another matter. The best this can hope for in the short to medium term is a bus service. Overall, the likely demand for new development (based on absorption rates into the Toronto real estate market) would at best consume 1/5 of the Port Lands area over the next two decades. Almost two thirds (60%) of the residential demand can be handled by parcels north of the Keating Channel at the extreme northwest corner of the site. The corresponding percentages for other land uses are 50% for commercial space and 150% for retail space. These lands are not even formally part of the Port Lands. Similarly, development of the lands closest to the eastern harbour would satisfy more than 100% of the residential and retail demand for 20 years. The next blocks to the east (still west of the Don River itself) would add to the excess. At this point, the scale of development would still be below 25% of the total Port Lands site. A related question is whether all of the lands shown as residential blocks in the most recent plan should, in fact, remain in that state. Originally, a more complex Don River mouth and an extensive park system occupied some of this land. Given that the Port Lands are huge, why are we giving away the best sites to condos rather than public space on the waterfront? Any transit plans will have to adjust to the land use scheme Council adopts later this year. Missing from the Waterfront Toronto analysis is any sense of the demand buildup on transit (and roads) that will be triggered by various stages of development on Queen’s Quay East and in the Port Lands. We know the end-state requirements, but not the timing for each phase of the build-out. What infrastructure should be built today, in advance of development, for transit rather than appearing as an afterthought? Will the TTC plan for enough buses and streetcars? What are the limitations on buses and streetcars to handle demand from the eastern waterfront and deliver riders to the core area and the subway system? Already, developers on Queen’s Quay who expected an LRT to be in place for their new buildings are complaining that the City and Waterfront Toronto have short-changed them. People buy condos on the premise of living close to downtown with good transit, but that’s not what they can see simply by looking at the street and the ongoing debates between various agencies on transit and traffic operations. For far too long, waterfront transit has escaped being part of the mainstream of debate at Council and the TTC. Both Toronto’s Transit City and Metrolinx’ The Big Move ignored the eastern waterfront. The “subways vs LRT” battle focused on suburban routes and neighbourhoods. Recent experience shows us that Toronto Council can have mature, well-informed debates about transit. This quality and detail must now turn to the long-ignored problems of waterfront development. Instead of normal bike lanes along Cherry, why not a Montreal-style bike path between the streetcar lanes and the sidewalk on the east side of the street? Since all turning traffic will be signalized, that would allow for a bike path with minimal risk of collisions. Seems like a natural fit. Steve: The bike lanes were always going to be part of the road infrastructure, not the transit side of the street. In your proposal, you forget that there will be transit stops where pedestrians would have to cross your two lanes of cycling traffic. There is a prototype on Roncesvalles, although that’s one way on each side. It’s one thing to have transit riders looking in the same direction as an approaching streetcar to watch for mad cyclists, but quite another to require them to look in both directions. Perhaps this is a little too late, as the E.A. already picked a side ROW alignment for the Cherry streetcar. The conceptual street section seems to only show one through lane and no parking on the street. So given this why not design the intersections as compact/mini-roundabouts, similar to the Lyon tram/LRT system, with a bit of a twist. These roundabout are stop signal controlled on the roadway when the tram approaches, so an absolute tram priority scheme can be worked in as there is not a need to hold a signal phase or get back in step. But the delay to roadway users is also held to the absolute minimum. It would presuppose a center alignment dedicated right of way in this case, which seemed to be preferred per the E.A., except for streetscape plans. So here is the twist, incorporate a pedestrian scramble crossing next to the transit priority all stop signal. All it would require is a lengthening of the transit priority hold on roadway traffic. Since people and transit arrivals are highly correlated it would minimize delays to people. So essentially the roadway and bicycles would be given free reign in the roundabout for say 70 seconds, or whatever the exact time till the next streetcar arrives. An all stop call on the roadway approach signals at the time of the streetcar arrival assures that it can slip onto the far side of the intersection, say 6 seconds, then a 18 second pedestrian and bike (slow) scramble follows which would allow for transit users to get to the streetcar. I will send some drawings later. You could also eliminate platforms in this scheme and use a variation of the Melbourne easy access stop, where the roadway section of the street rises to 14″ above the streetcar tracks. Since an all stop is called on the roadway people walking in this portion of the street is not a problem. The entire street right of way could be 28 m with parking and bike lanes. Steve: Roundabouts require more space than a regular intersection, especially to accommodate trucks, and there has already been debate about Cherry Street being too wide. The final design is narrower than the City’s original proposal. The east side alignment also ties in with the design on Queen’s Quay where transit will be on the south side of the street. The eventual intent is for these layouts to hook up via a revised road layout at Lake Shore, Queen’s Quay and Cherry. As for pedestrian scrambles, I suspect there will be a lot of J-walking given the layout of the street. Don’t forget that streetcars arrive in two directions, and on the headways likely on this route, they are unlikely to see to-the-second arrivals. “Transit first” has always been stated as a Waterfront Toronto principle, and indeed their neighbourhoods have been designed on the assumption most travel won’t be car-based. It’d be a big shame to jeopardize that for such a comparatively-small amount of money. Transit First is a very important policy and it would be very short-sighted if the LRT was not “ready to “roll” on Cherry as soon as the Pan-Am Games are over. In fact, I see no reason it should not be operating before the Games as there will shortly be a vastly increase residential population in the area thanks to the two condo towers being built in the Distillery just west of Cherry. I understand that the West Don Lands will not get a ‘regular’ population until after the Games but WT needs to look across the street and see that there are other people very close who also need transit. Steve: More to the point, the TTC needs to “look across the street” and stop ignoring the population growth in the eastern waterfront generally. Steve, do you know what type of service is being planned on Cherry Street (full revenue-service, rush-hour only, short-turning branch, etc.)? I wonder if it would be a net new route created or a branch/split-off from an existing route? Steve: Nothing specific has been announced, and a lot would depend on whether the through route to Queen’s Quay would be available in the same timeframe as the Cherry line opens. If it is just a stub, it would probably be a shuttle running from Cherry Loop to the west side of downtown. I can just imagine the TTC sending the cars officially to Spadina, but short turning most of them at Church so that they miss the University subway eastbound. A through service from Broadview Station to Union (an eastern variant of the 510 Spadina) would provide good connectivity, but I am not camping out at my local station waiting for one of these to show up. There is one moment regarding the redevelopment between Yonge and Lower Jarvis, which is not being discussed in media, but it seems to be important for me. Redpath plant is going to stay in the very centre of development for decades – I got an invitation last year for public hearings over construction of a new electric power facility there. My concern is the smell of molasses – it is just awful and spreads all over Queens Quay from Bay to Sherbourne, especially when it is hot. It might not be a problem today since there is no residential buildings around, but when the redevelopment is completed, this is definitely going to be an issue. I wonder why this problem was not addressed by developers? “We sold you condos, got our money – now it is no longer our problem. It is you who is going to live here, not us.” I can be wrong though – but I’ve never heard this was discussed before. Steve: I too have never heard of this issue in any discussion of the evolving developments near the Redpath site. The issue has always been how to maintain truck access across the LRT right-of-way. (“Code A” means the cost was between $50,000 and $249,999). Swan Boats on Lake Ontario, perchance? Steve: I think that Waterfront Toronto does not trust the TTC to do an unbiased review given their foot-dragging on so many issues related to Queen’s Quay. As for any Swan Boats, I must declare a conflict of interest and remain mute on the subject. I think it is safe to assume that the plans for non-residential development will prove to as unrealistic as those for NYCC. If so what are the implications for potential transit ridership? Steve: Much of the demand projected for the waterfront east service originated from the residential development. One advantage it does have compared, say, to NYCC or STC, is that there is a really big attractor (downtown) nearby, and not a whole lot of alternatives. The suburban nodes, by contrast, have a wealth of places to commute to and this dilutes the potential traffic in any one direction. Mute on Swan Boats! You should know that Mute Swans are an invasive species. You should trumpet your support for native Trumpter Swan Boats. I love smelling the molasses as I pass Redpath! At the end of the day it’s true office growth drives the majority of transit use. I also agree with Glen it’s going to be hard to attract a lot of office use here. Correct me if I’m wrong but I think the Monde development started out by having 300,000 square feet of the podium completely devoted to office space … granted that’s a lot of office space … but they gave up relatively quickly and converted it all to residential. I think they’ve already started marketing the 2 office buildings (about 200,000 range) on Queen’s Quay east as part of the Bayside development by Hines. Yes we’ve seen a lot of office growth downtown (not anywhere else in Toronto [the 416]) but there’s still enough land around Union and a few plots downtown that I think new development will be focused there for at least a decade or so. 1) Many more people want to live downtown. 2) Many more people have jobs in the 905, as that is where a lot of the office growth is taking place. For these new waterfront neighborhoods to be great there needs to be office use, cultural attractions, and good design, we can tell they have the good design down from the quality of the parks built already (the best in Toronto really … all the credit to Waterfront Toronto here). But I’m afraid the office use just won’t happen. Here’s the best part in my opinion; We all arguing transit use is a big factor here, I don’t think it makes a difference at the end of the day in terms of attracting office use. There could be a LRT or BRT or plain old bus (or no transit whatsoever) but office use won’t come on a large scale. Now as you mentioned the high order transit use could be driven completely by residential growth, but it means we won’t really get the great vision waterfront Toronto surely has for the mixed use areas. It will make a difference if there’s a LRT or BRT or horse and carriage to be frank; The office use won’t happen on a big scale. > I think it is safe to assume that the plans for non-residential development will prove to as unrealistic as those for NYCC. If so what are the implications for potential transit ridership? Both the Portlands and NYCC could easily see a lot of job growth in the future. NYCC already has a subway, and the Portlands has a lot of developable land and could potentially be near the Downtown Relief Line in the future. Meanwhile the easily developable land within walking distance of Union Station is expensive and will likely be exhausted in 10-20 years. The main reason that NYCC has not seen much job growth is because of high commercial tax rates in Toronto, and there has been little effort to significantly reduce them. Competition from car oriented business parks with little transit service in Markham/Richmond Hill, which have more office space than NYCC has hurt NYCC job growth and is the main reason that ridership projections for the Sheppard subway are low. Steve: I don’t think that the Port Lands are likely to be anywhere near the DRL given that this line will almost certainly stay north of the rail corridor as this ensures a better connection through the core area of downtown. Even with a link north, say, via Cherry to a station near the Don River and Queen, it would be simpler for someone to take a one-seat ride over to Union via Queen’s Quay than having to change to the DRL for a few stops. If the Queens Quay East LRT interim construction terminates at Parliament Slip loop, won’t that involve some serious deadheading to get cars in service? Or would they store cars in Union Loop? Steve: Not much more than for the existing 509, and nowhere near as bad as the 512 St. Clair cars. It has always seemed to me that the terminations of QQE at Parliament Slip and Cherry at the railcorridor loop were two projects within hollering distance (okay, 1000m or less) of each being planned in dread of the cancellation of the other and to make absolutely sure there would no crazy joinedy-uppy thinking they threw that significant chunk of land between Cherry, the rail corridor and Parliament into the Lower Don Lands. 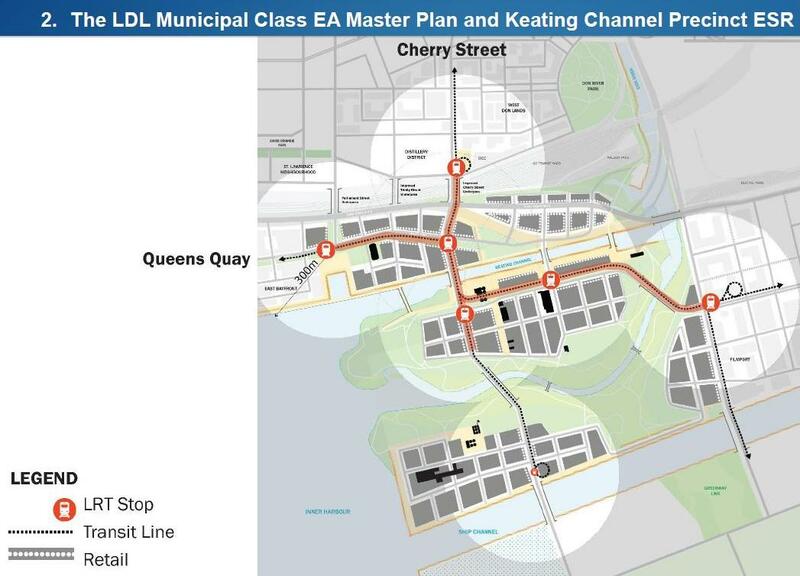 I’m no urban planner and I’m sure someone’s thought of this already but if the dividing line between WDL, EB and LDL was shifted to the Keating Channel then we could plan an integration between all these near-term expansions and leave the greater notions of a marsh to replace the Docks Nightclub for future decades. If affordability is the issue, then having a single loop at Cherry Street and a realigned Queens Quay moves that loop to a (for now) less valuable space, gives an escape route for both routes’ streetcars in the event of disruption east of Bay or south of King and allows development at both of the existing and for now more valuable sites nearer the core. Steve: The affordability issue has more to do with the cost of rearranging the roads (including a new underpass at the rail corridor) than with the LRT project. But, yes, I agree that the way the subprojects have been divided up works against doing the “landward” side as one project. I’ve noticed that the Cherry Street right-of-way is being designed for poles flanking the streetcar right-of-way, as opposed to in the middle of it (like St Clair), or all the way off to the boulevards and sidewalks (like Spadina). Steve, what’s your view on poles flanking the streetcar right-of-way? Do you believe that such a configuration genuinely conserves more space over the centre-pole design? Should flanking poles be used more often in other LRT applications? The way I see it, flanking poles allow for free-wheeled vehicles to drive down the middle of the streetcar right-of-way in both directions, and don’t take up space from the sidewalk itself. However, they also require additional clearance at the transit right-of-way edge, which may offset the space savings. Steve: Centre poles add about one metre to the width of the right-of-way, and this was clearly shown on construction drawings for St. Clair where there were transitions between centre and side poles (e.g. at intersections). The centre poles also make life more difficult for free-wheeling vehicles like buses and fire trucks. In the context of Cherry Street, the poles will occupy a strip of the edge of sidewalks reserved for utility functions, and won’t interfere with pedestrians in the same way that centre poles interfere with transit vehicle clearances. I strongly believe that the centre poles on St. Clair were a mistake, but they were forced on the TTC by the original street lighting design that would have moved the side poles (still present, of course) further apart. The actual implementation saw those poles stay at more or less their original spacing when the city discovered that there was not enough light falling on the street with fewer luminaires — just one of the little design screwups on St. Clair. The TTC defended the centre pole arrangement with a lot of bafflegab at the public “consultation” sessions even though that extra metre of clearance could have been reassigned to the sidewalks or tight spots in road lanes. With most of the Pan Am games now set to be hosted at Exhibition Place, are there plans now to speed up a waterfront lrt system that both links Union Station to the Ex and Union Station to the Athletic Village? How about a pressing need to link the Sheppard LRT to UTSC for the swimming events? Steve: There already is a line linking Union to the Ex. The only problem is that the station at Union is so undersized, and the “traffic signal priority” enroute so pathetic that it won’t be able to provide huge capacity. Don’t hold your breath for the “Bremner streetcar” as that requires major construction at Union Loop for which there is no funding. As for UTSC and the Sheppard line, there is still talk of that connection, but the line won’t open (thank you Rob Ford, thank you Dalton McGuinty) until long after the games have ended. By the time the Pan Am games hopefully the reconstruction of Queen Quay West to make the ROW on the side of the road will be complete and the signals will be redesigned to improve streetcar flow.